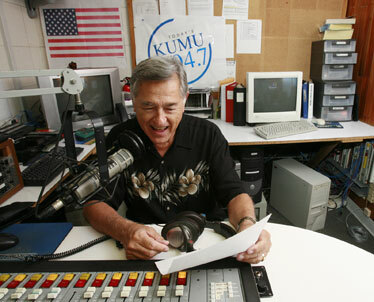 Bill Baist takes up his post in the studios of KUMU 94.7 radio. Baist has been a familiar voice on local radio and television for more than 40 years. Friends and colleagues call Bill Baist "The Golden Voice," an appropriate moniker for a hard-working professional who has spent his career in broadcasting. Baist has appeared on local television and radio for more than 40 years, and audiences are still listening. Baist was born in Honolulu and graduated from University High School in Manoa in 1957. He started his broadcasting career as a staff announcer for local KAIM radio. "My heart and passion is in broadcasting," Baist said. "I started working as a staff announcer at age 16 for KAIM radio. It was a good training ground for me." He left for the University of Oregon in Eugene, where he co-managed radio station KUGN, taking charge of programming and overall operation while working as a deejay and account executive at the nearby Cottage Grove, Ore., station, KOMB. His first venture into television was as weatherman at the CBS affiliate in Eureka, Calif., in 1959. Baist returned to the islands in 1961, working for Matson and later Aloha Airlines in marketing, advertising and sales. In 1965 he was hired at KGMB to work for both the television and radio stations, handling duties as music director, deejay, air-watch traffic reporter and television program announcer. A year later he was at KGU as program director, working with local legends of the airwaves such as Hal "Aku" Lewis, Joe Rose, Sam Sanford and Lucky Luck. He also worked at KHON-TV part time, handling staff announcing as well as hosting the programs "Who's on 2" and the "Dialing for Dollars" game show. "It's no exaggeration to call Bill Baist the most valuable player in the early days of Hawaii radio and TV," said Bob Basso, who worked alongside Baist at KHON. "He saved the day a thousand times for all of us, and he was and is one of the nicest, most easygoing professionals you'll ever meet. He's a media Hall of Famer who could and did it all." Baist's news show was promoted in a 1969 advertisement in TV Time. 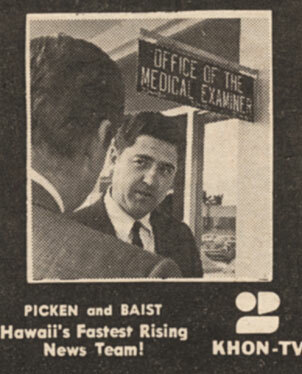 In 1968 then-KHON news director Don Picken hired Baist to anchor the 6 and 10 p.m. newscasts. "I liked Bill a lot," Picken said. "He was articulate, gentle, professional, a genuine nice guy with a pleasant smile. Hard-working, too, holding down his radio job as well as the one at Channel 2." Memorization skills were important in those days, Baist said. "We had no teleprompters back then." He anchored the local news in the pre-satellite days, when NBC's "Huntley-Brinkley Report" was flown in from Los Angeles to air after the local news. In 1970, Bill became a sales and marketing executive with KHON and was directly involved in producing commercials. He became a familiar face on camera through the 1990s as spokesman for Honolulu Nissan-Chrysler-Plymouth, City Mill, Hawaii Pontiac dealers, J.C. Penney, Shiseido of Hawaii, Petland and American Savings Bank, among many other banks, clothing stores, jewelers and restaurants. His voice-overs also can be heard in video and film pieces for tourism groups and in commercials locally and for furniture companies in the Detroit area. And Baist can be seen as Detective Nakamura on a 1970 episode of "Hawaii Five-0," with actor Tom Skerritt. "I heard casting had an opening, so I tried it," he said. "I read the part and got the role. It was easy to work with James MacArthur; I had a lot of fun." For the past 15 years, Baist has been with Oceanic Cable, working in the Oceanic Time Warner business class division. His wife of 16 years, Margo, is also a University High School graduate; they have five children, eight grandchildren and a great-grandson. The "Golden Voice" can still be heard on weekends from 6 a.m. to noon on KUMU-FM, where he has been a part-time deejay for more than 20 years. "If you really want to break into the broadcasting profession," he advises, "it's good to have a degree, but don't give up, take whatever is available to you and work your way up."